This is a great idea for anyone who uses their 18650 rechargeable flashlights and needs to have a spare charged battery available. You can re-charge your battery in the car at the DC terminal or a USB port on your PC, laptop, what have you. 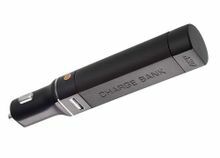 The Charge Bank accepts an ASP 18650 battery (included). It provides visual indication of 25%, 50%, 75% or 100% charge. Pressing the gold activation button displays the battery capacity. The Charge Bank provides convenient charging, transport and storage of ASP 18650 batteries. The Charge Bank includes one 18650 battery, 18650 Link Storage Case and a micro USB to USB Retractable Cord.